The Buddha contemplates his achievement of complete knowledge under the Bodhi tree. He was tempted to enter Nirvana at once (By Mara), but he wants others to know the true doctrine, and resolves to communicate his doctrine to others. 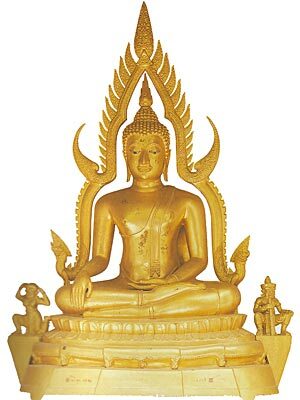 The Buddha walks with hands (right hand on top) in front of his abdomen, the left ankle lifted. 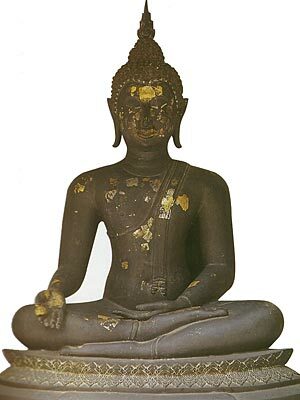 Completely aware, the Buddha is dedicated to teaching the Dhamma to the suffering humans on this earth. Sitting in meditation, protected by Mucalinda's cobra hood. The right hand holds a small fruit (samaw, a medicinal fruit of the gall-nut tree). 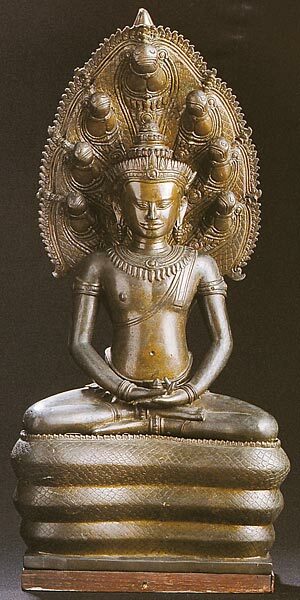 This is offered to him by Indra, while the Buddha is seated under the Ket tree during the seventh week after his enlightenment.